"Playful spirits" - or when party balloons reveal the convection cells inside a building. On the occasion of an Innovative Learning Week event in February 2016, The School of Engineering (Dr Dimitri Mignard) and HeatHack (Dr Jean Carletta) came up with a highly effective and entertaining way of visualizing the convection cells inside a high-ceiling church, namely St Columba's by the Castle in Edinburgh. With the help of congregation and HeatHack volunteer Mr Iain Thompson and other participants, we used neutrally buoyant helium balloons to track the motions of the air, giving a 3-D picture of where the heat gets transported and dissipated at windows and ceilings. 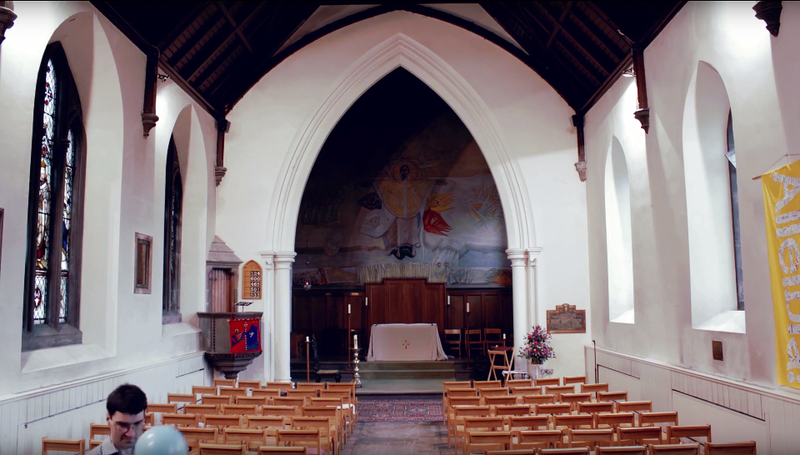 The long term goal of our joint activity between the University, HeatHack and local churches is to inform improvements to heating efficiency within this type of buildings. In fact, our improvised experiment in St Columba's went so well on that day that we came back a couple of months later to repeat it, this time with photographer Mr David Dorman producing a time-lapse movie of it. For some reasons, the results were a bit more erratic this time (was steady state perhaps not reached?) but nevertheless interesting and still with much visual appeal. The following short excerpt of the full movie illustrates the phenomenon sufficiently well. The full movie can be seen on HeatHack's website: http://www.heathack.org/2016/08/22/tomorrow-plus-a-bonus-video/. St Columba's HeatHack on YouTube.